When anyone begins to research the history of pubs it is inevitable that they will soon come across one or more of Thomas Burke’s works on English inns. 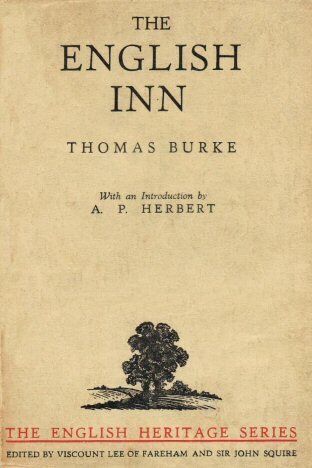 Given that books on inns and taverns were relatively scarce during the 1920s and 1930s, Burke could be described as ‘prolific’ in his writings on the inn with the publication of The Book of the Inn (1927), The English Inn (1930), The English Inn Illustrated (1931) and the less well known Will Someone Lead Me To A Pub? (1936). In addition a number of Burke’s works, for example The Beauty of England (1933), featured numerous observations of inns which he visited during a motor car tour of the English countryside. In at least one of his many novels the story is centred round a public house. The tale, The Sun in Splendour (1926), is set in Islington, London and the pub concerned is probably based on one Burke knew in Camden Passage. One reviewer of this book described the landlord as ‘a good comic character’ and the story as having ‘a wonderfully funny ending.’ London was Burke’s main area of expertise and much of his work centres around the capital, but fortunately for pub historians his work on English inns had a much wider remit. Thomas Burke was born in the East End of London in 1887 of extremely poor parents both of whom died whilst he was still an infant. He was then looked after by an uncle, a gardener from Poplar, until he was nine and in 1896 was sent to an orphanage in the country. He detested the rigid discipline of the orphanage yet wrote appreciatively about his life there in his autobiography The Wind and the Rain published in 1924. At 14 years of age Burke went to work at a boarding house and a little later was employed as an office boy in the City of London. It was here that he accumulated his in-depth knowledge of London and particularly the East End upon which many of his novels, poems, short stories and miscellaneous writings were based. Burke began writing at 15 and in 1906 attracted the attention of a literary agent who gave him employment until the outbreak of the Great War. During the war Burke worked at the American branch of the Ministry of Information. In 1918, he married authoress Winifred Wells who wrote under the pseudonym of Clare Cameron. Burke was an amiable and honest man, contemptuous of literary and social climbing; a man who held strong opinions and often upset others by his dogged adherence to them. Self-education instilled in him a high sense of value of ordinary things too often taken for granted, like, for example, the English inn. The book is indeed a trail-blazer and reveals more about the English inn than most works by other authors which preceded it. It also formed the template upon which many more books on the inn would be based. The country is conveniently split into four divisions, London and the Thames Valley, South Western England, South Eastern England and Northern England. He tells tales of good hospitality and generous meals, of songs and stories and disputes and comfortable beds of ‘shovel-board’ and darts in a seemingly unending journey across the country. Although I recognise and appreciate the book’s significance as an historical record I found Burke at times trapped within some kind of creative recess which caused him to see little to criticise. Contrary to what A. P. Herbert had written, I found Burke, in this work at least, to ere a good deal on the ‘romantic’ side. Where, for example, was the ‘villainy’ of the trade and the hopeless landlords observed by Ivor Brown who seemed to venture upon them as a matter of course whilst in search of the idyllic rural inn in ‘The Inn’ written less than five years later? Interestingly, in The Beauty of England, Burke bemoaned the inn trade whose landlords had ‘little interest in their inn save as a business’ and decreed that it should be a self-imposed duty upon landlords ‘to write up week by week the happenings at their inns.’ If this had been done in the past we, as pub historians, would indeed have ‘intimate and illuminating sidelights upon people and periods throughout the centuries, instead of fragments which are only unearthed by painstaking search among old documents.’ (We know where you’re coming from Thomas!) Despite suggesting that ‘for the interest of future historians and students of the twentieth century…all English innkeepers…begin now’ and having as a prime example John Fothergill’s An Innkeeper’s Diary, published in 1931, the concept fell on deaf ears; well except for those belonging to John Fothergill who went on to produce My Three Inns in 1949, not to mention John Fothergill’s Cookery Book which hit the shelves in 1943. 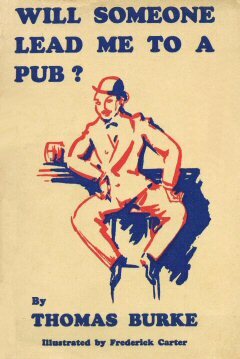 Burke’s 1936 work, Will Someone Lead Me To A Pub? – a title derived from a quote borrowed from G. K. Chesterton - has probably the longest sub-title ever in the history of pub writing, no less than 89 words! In essence it is simply a tour of what Burke knew well – the old and new taverns of London. In this book, written only six years after The English Inn it is clear that the inn is far from dead. It has survived in the capital at least because it has adapted itself to the changing needs of each generation. Illustrations by Frederick Carter admirably compliment the entertaining text of Will Someone Lead Me To A Pub? Thomas Burke died in 1945. He was a ‘Londoner of the Londoners’ and had built a literary reputation by writing about what he knew best. For those interested in the general history of pubs, The English Inn is a fine starter. For those studying the history of London’s pubs his legacy is great, much information being revealed from within his novels and other writings outside of the books already mentioned here.